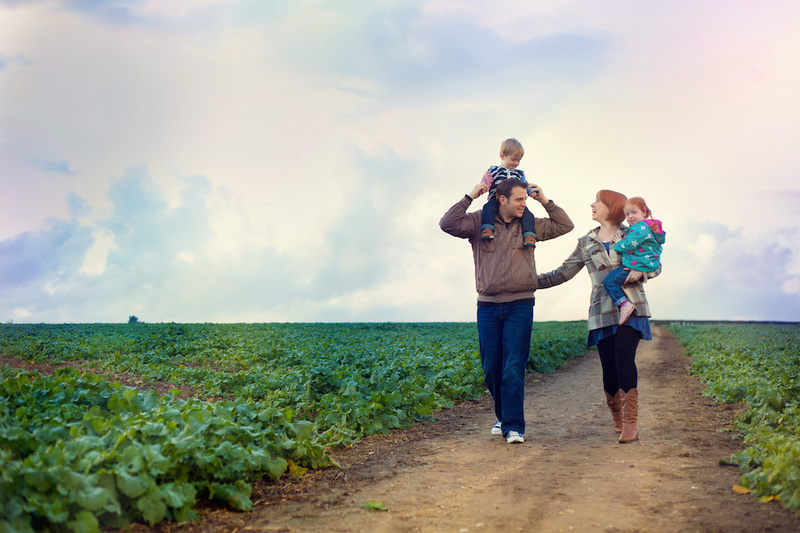 Donna sent me a family photo from a recent photoshoot that she wanted in her header, and we chatted about her favourite styles of fonts and websites. I began to put together a design that had nods back to Redhead Babyled, while still feeling like something new. I started with the basics; font choices, general layout ideas, and an initial colour scheme based on the photograph. Once Donna had approved my initial ideas, I set to work creating a new blog logo and putting together a header image. Donna expressed concern about wanting to change the photo every year or so, in order to keep the site fresh, and so I decided to overlay the logo on top of the photo rather than have it as part of the image, so that the header photo can be changed in the WordPress admin whenever Donna wishes. The colour scheme can be completely changed in the WordPress admin to match whatever photo Donna uses in future. 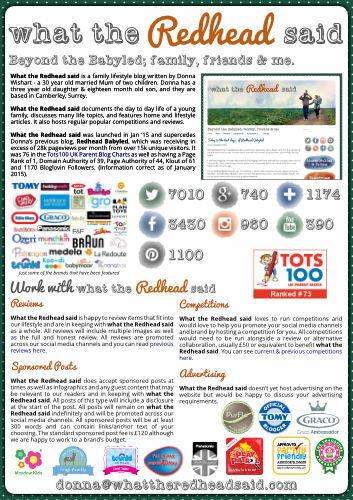 I wanted to use the same font (Pacifico) and colour for “Redhead” as Donna used for Redhead Babyled, so that her logo would be recognisable to anyone familiar with her previous blog. The dark grey typewriter font (VintageOne) looks great alongside it. For the header photo, I used photo editing software to “invent a field” as my husband put it, changing the aspect ratio of the image to make it more suitable as a website header. Again tieing in with Donna’s previous design for Redhead Babyled, I took her old spotty background image and updated it to match the new colour scheme. I enabled the ability to change the theme background in WordPress admin so that Donna can update her background in the future whenever she wants to change her photo. To soften the theme a little, I used watercolour style graphics for the social media icons and sidebar links, all using the same colours I was using throughout the site. 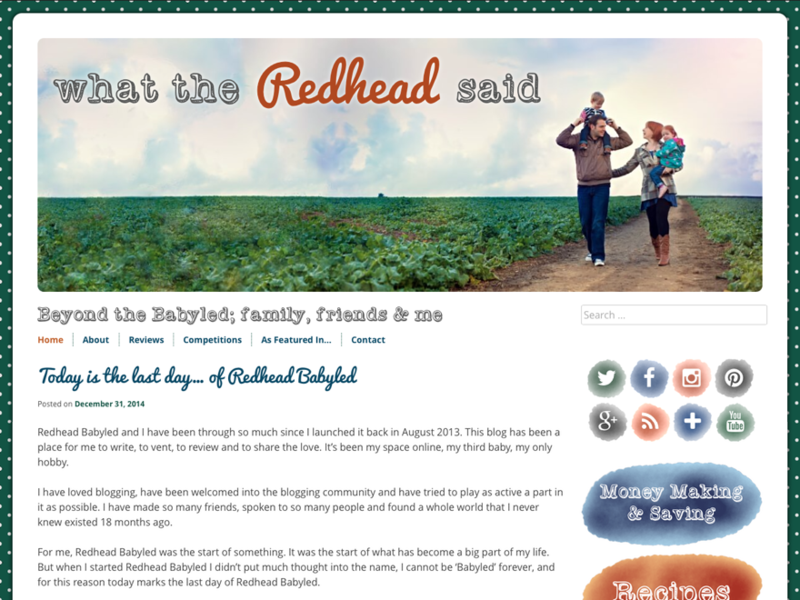 Donna came up with “Beyond the Babyled; family, friends & me” as her new tagline – another nod back to her old Redhead Babyled site. Finishing touches to the design were a matching blog badge, a high res favicon, and matching twitter & facebook graphics. The design is fully responsive, and should look great on any modern device, with some styling depreceating gracefully on old browsers. I worked with Donna to make sure the advertising banner she wanted to host was responsive and as non-intrusive as possible. Donna has a lot of great content, and it can be challenging to make old content easily accessible for blogs. With Redhead Babyled, she was manually maintaining pages that listed reviews, recipes, competitions, weight watching and money saving posts. Donna was having to spend a lot of time updating these pages whenever she posted relevant posts, and having to remember to go back and moving closed competitions from the open competitions list to the closed list. My aim was to get her site to do the work so she didn’t have too, by implementing a custom plugin I have been working on. It is a long way from public release, so had to do a lot of code changes to customise the plugin exactly for Donna’s site, but all of these index pages are now generated on the fly, using post categories and a new custom “closing date” field for competitions. Donna takes great photos for her posts, so she wanted her latest recipes posts to use images instead of links on that index page, and we decided to do the same for open giveaways as well. I added code for accompanying sidebar widgets too, so she could have sliders displaying her open competitions images and latest recipe photos in her sidebar. The weight watching, reviews & money saving pages all have accompanying widgets which display a list of the five latest posts. In addition to the custom plugin, I installed & configured various plugins to provide what Donna wanted from her new blog. As well as a new design, what the Redhead said needed a new url. I handled all of the blog transfer to the new url, and set up 301 redirects on her old site to forward on traffic. All posts, pages, comments & images were transferred to the new site seamlessly, allowing Donna to pick up right where she left off. Donna needed a new media pack to send to interested PRs and brands to match her new design, and so I offered to put one together for her. I used the information Donna provided to create a complimentary one page pdf document. Well there you have it; what goes in to rebranding a WordPress blog… a lot of hard work and hours of facebook conversations between Donna and myself! It looks fabulous. Love the idea of the blog doing it’s own admin – that’s definitely something I could do with! The photos for the recipes and giveaways are great but above all I have massive media pack envy!! Thanks! I like to make blogs do the heavy lifting with things like that – bloggers should be able to concentrate on creating content, not updating pages of links. Looks wonderful ladies, I can see me heading your way at some point this year once I’ve put some pennies away as I have no tech abilities and would love to change a number of things with the blog. what a fab talent to have, and how nice to take the blog through its development to its next stage. Ok, so now I’ve seen this, you might find my request expanding slightly! Getting excited. Although might involve me doing quite a lot of work to get it ready and workable for you. Must blog in time to sort it out ready as my Christmas time plan didn’t happen! What a fantastic redesign, blog name and change. Great work Zoe and fab taste Donna!